A rustic Indonesian mahogany dining table can give a great look to any dining area. Mahogany tables are popular choices for a variety of decors. If you're in the market for mahogany furniture, you have several options. Sources for mahogany wood come from many regions of the world. Indonesia is renowned for having high quality wood as well as craftsmanship, which makes Indonesian dining tables so desirable.There are several points to consider before you purchase your table. Veneer tables are a composite of wood strips glued over some other kind of wood. Many people find this to be advantageous because of the price break. Quality veneers can give a finished look to the table without the added weight and expense of a solid wood table. Most authentic Indonesian tables are made of solid wood instead of veneers. Be sure to ask or read the detailed descriptions before purchasing. If you are seeking a good source for an authentic Indonesian mahogany table, you'll want to find a retail store that carries imports or buy from a seller online. Because of the enormous shipping costs, it would be cheaper to purchase your dining table from an importer or retail store. However, you can purchase Indonesian furniture at wholesale prices by buying directly from the manufacturer or exporter. As mentioned, one of the things to consider when doing this will be the cost of shipping. These charges are often as much or more than the actual cost of the furniture unless you're purchasing a whole shipping container of furniture. Filling up a shipping container with furniture is the most cost-effective way of purchasing Indonesian furniture directly from the manufacturer or exporter. Not all wholesalers will sell directly to the public. Many restrict their sales to legitimate retailers, importers or designers. You'll need to check the frequently asked questions (FAQ) section of the company's website to see if individual buyers can purchase the company's products. If you don't see the information on the site, you can always email customer service to inquire. You will want to carefully inspect any antique dining tables for buckles, swelling, or splits in the wood since older furniture wasn't kiln-dried. The lack of kiln-drying meant more moisture was left in the wood, and when it dried out, warping and splitting often occurred. Many times wood from rubber trees is used in place of mahogany and sold as a true piece of mahogany furniture. You need to be sure of what you are buying. Ask about the actual wood and not just the finish. Just about any wood can be stained in a mahogany finish. Educate yourself on the topic of mahogany wood before you buy. Mahogany is a light to dark reddish brown hardwood. Its medium grain provides an excellent wood for hand-carving and is why it became a popular choice for furniture manufacturing. It has been used for Indonesian furniture since the 1700s. Mahogany is grown in many tropical regions of the world including Africa, Central America, South America, and Indonesia. Central Java in Indonesia is well-known for its production of mahogany. Some of the best Indonesian mahogany is harvested from Kalimantan's plantations. Most of the rainforest trees harvested from Central Java are between 20 and 40 years old. Mahogany harvesting is done from either old growth rainforests or plantations. Both are regulated by government guidelines for harvesting and replanting. A lot of plantation-grown mahogany will have small knots within the finished planks because the wood harvested isn't old growth like that harvested from rainforests. 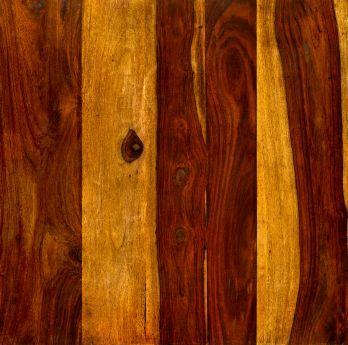 Plantation-grown mahogany planks are approximately six inches wide, whereas rainforest mahogany wood planks can be up to thirty-two inches in width. Since mahogany is such a slow-growing tree, it takes several years before farmers can make money from harvesting the wood. That's why many farmers are abandoning mahogany in favor of the faster-growing Albizia trees. This change could impact the industry with less mahogany to harvest in the coming years. You have many choices of suppliers for your table. 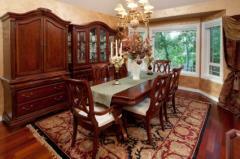 You may choose to seek out a local furniture retail store and inquire about special ordering your table. You may prefer to order directly from the manufacturer or exporter. However you end up purchasing your rustic Indonesian mahogany dining table, you will be able to enjoy it for years to come.